TECH CORPS, AT&T and Ohio colleges team up to educate high school students about coding and computer science. Capital University (Columbus), Sinclair Community College (Dayton) and Zane State College (Zanesville) are gearing up to host the 2018 TECHCORPShack on Friday, November 16, 6pm-9pm and Saturday, November 17, 9am-4pm for high school students in grades 9 through 12. This event, sponsored by AT&T, will give high school students in the Columbus, Dayton, and Zanesville regions the opportunity to learn about computer science in a fun, engaging and inclusive environment. To apply for this event, students should visit bit.ly/TCHack18. If you’re interested in volunteering, please visit bit.ly/TCHVol2018. The deadline to apply is Wednesday, October 10. For more information about TECHCORPShack, please visit http://techcorps.org/content/tech-corps-hack-2018. Let’s celebrate – Summer 2018! 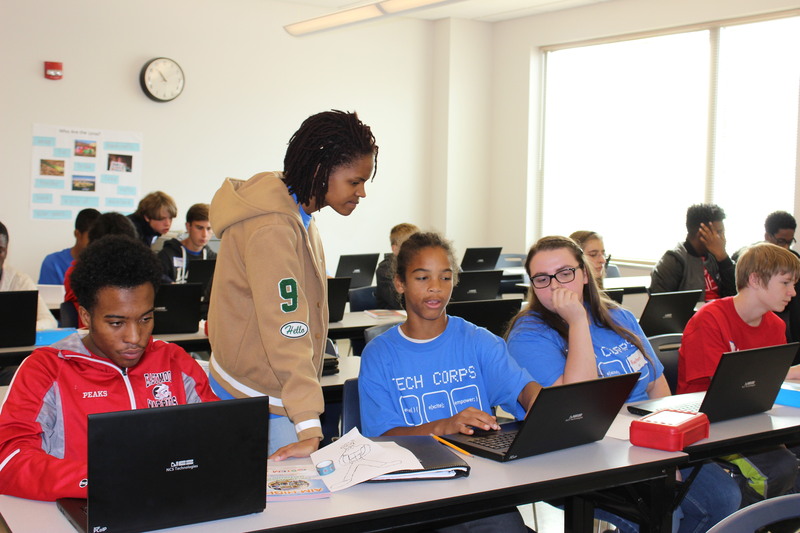 As summer comes to an end, so do many of our TECH CORPS programs. We want to thank all the people who make our camps and programs possible– sponsors, partners, volunteers, parents and staff. In just 10 weeks this summer, nearly 1,200 students and more than 50 teachers participated in TECH CORPS programs. We hope you will join us in celebrating their accomplishments. This video highlights just a fraction of our work to Educate, Excite and Empower – enjoy! My name is Madeline Foley and I’m finishing up my undergrad this fall with a Bachelor of Fine Arts in Electronic Media, and I’m starting an Art Education Masters, both at the University of Cincinnati. This summer I worked with TECH CORPS doing all things media. I came to work for TECH CORPS through The Columbus Foundation, where I’m part of the summer 2018 fellows cohort. I’m so thankful they placed me here! There were different areas of media that I dabbled in this summer. One thing I did was graphic design. I worked on promotional graphics for Kroger community rewards, and Amazon Smile. Both companies will donate to us if you sign up! We had promos for these already, but they definitely needed a makeover. I created a quick image to celebrate that we were given a Columbus Wonderful Workplace award this year! I also was able to work on a campaign with multiple graphic pieces, so that was a cool experience. In November we have an event called TECHCORPShack, which is a fun hackathon event for high school students. I created three pieces to be used to promote on social media and across our platforms to spread the word. I really had fun with these and tried to make them stand out! Lastly, I created an image to promote The Big Table event with The Columbus Foundation. Another leg of what I did this summer was creating video content. I’d definitely say that I focused the most energy in this area. I spent a lot of time working on groups of short videos, but also longer, stand alone videos. I created promo videos for the the E4Tech Program, Student TECH and Student WEB CORPS programs, a TECH CORPS to Per Scholas Pathway video, and a 2018 Summer recap video. The group of videos I worked on was a Summer Youth Employment Spotlight series. 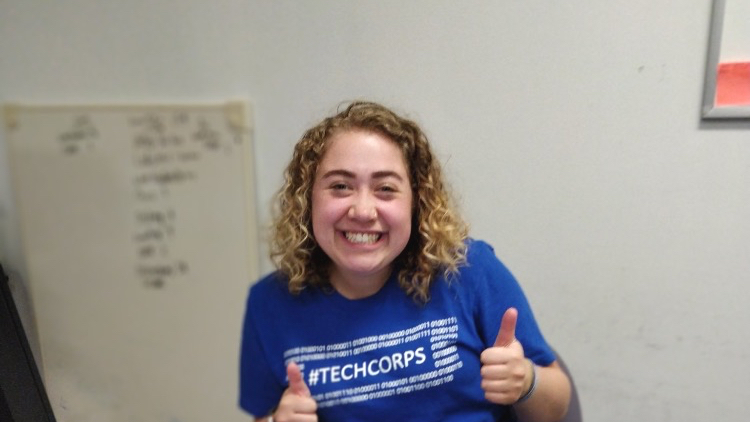 We have so many amazing student employees who all have their own stories, so we wanted to document and share their journey with TECH CORPS. I conducted interviews with them and put together short, minute to two minute long clips highlighting them individually. This was a really fun project for me. The third aspect of my job was to run our social media. TECH CORPS has a very active Twitter account, so I had to plan and make sure I was on top of it! I had a lot of fun with these kinds of posts, using popular hashtags to celebrate our students. Women in tech Wednesday was one I really liked, to show off the TECH CORPS girl power. Now, the final segment of my summer duties. I had the opportunity to visit a lot of our program sites and take pictures and videos, which I used later to edit into those videos I mentioned. I was even able to take a day trip up to Cleveland to visit our Northeast Ohio camps. This was really cool for me because I got to see just a glimpse of how our work affects other areas besides Columbus. We have Techie Camps in New Jersey, Rhode Island, Georgia, Ohio, Colorado, and California. Now THAT would have been a business trip. I got to see a wide variety of programs, including: Student WEB CORPS, Techie Camps, IT On Ramp, and E4Tech. My favorite thing to do this summer was visit Summer Youth Employment sites and Techie Camps. Seeing the students make friends and work with each other is so exciting and rewarding. I’m really glad that I had the chance to create a Student TECH CORPS video and update the Student WEB CORPS video because I got to spend quality time with these employees and their instructors. I couldn’t be more thankful for my summer at TECH CORPS. I learned so much professionally and personally. The experience totally flew by, I really don’t know where the time went. I want to continue working with both TECH CORPS and The Columbus Foundation in the future, so I can’t say bye forever. But I’m so glad I got to be a part of the team for this ten week period.